I think this is the most posting I’ve done in ages. 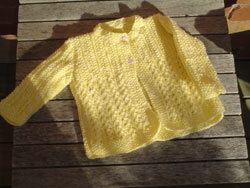 I finished the sweater and sewed the buttons on last night. I won’t have this sort of time after this week as the new job starts. But I may get some time to knit at work or on the bus. My goal is to change my lifestyle to include some exercise. I know I’ve gone on about this before and only made a bit of progress only to stop. It’s different this time. The new job is going to require a great deal of energy and organization on my part. I need my rest and my health to be able to handle the stress. I know I’ll be happier for it. I got the bike out last weekend and took it for a ride. I realized how out of shape I am but I also recognized how good riding the bike would be. If I can work myself up to it I could easily ride my bike on nice days to work. Imagine how fit I would be with a several 20 minute bike rides a week. Right now I’m just focusing on breathing and trying to relax. I can do this, I can make this big change and my family and I will be better for it. Very pretty sweater, I’m sure the baby will look great in it. Good luck with the bike, I hope you get used to biking to work, it does sound healthier than driving. This sweater is just beautiful. Remind me to let you sort through my vintage button collection the next time you come over, I’ve collected quite a few over the years and have some lovely ones that would work perfectly for baby sweaters.